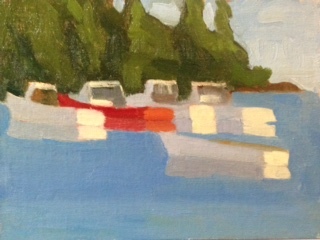 My last painting from the Anne Blair Brown class was painted at Owls Head Harbor. 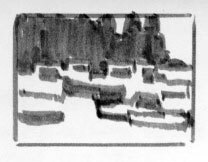 Through the class I came to rely more and more on my Notan thumbnails (see below). That was particularly important here, because the boats swung around while I was squeezing out my paint. So I used the Notan for the composition and glances at each boat to grab their dark light patterns as they swung. Then, when I got home, I broke my rule number 1 of plein air painting "Don't muck with it when you get home". I simplified a few things, and sadly I don't have a picture of the original. Lesson leaned! 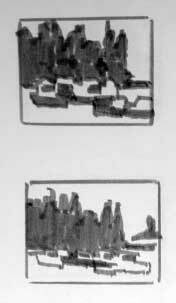 The Notan I used for the above painting. Other Notans of this scene, where I didn't think the composition was as strong.